This tool is designed to safely assemble the components of the barrel from a cut-up or intact barrel assembly. 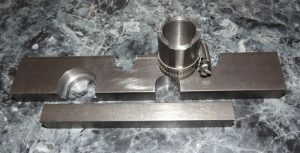 Like the other tools it is a superior replacement for plain press plates and rails that are available elsewhere and allows the thin-walled barrel components to be moved without damage. This tool is designed solely for the Zastava RPK rifle barrel and does not work with the Romanian RPK barrel. Similar to the previous tool it is manufactured from 5/8″-thick x 1 1/2″ wide x 9″ long AISI 1018 cold-drawn steel that is not heat-treated. 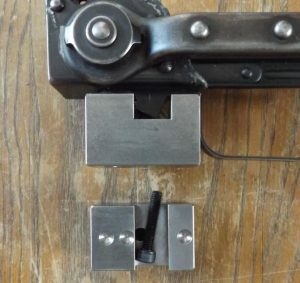 The GS-0015 is a bucking block used to buck the rivets used to fasten the pistol grip nut found on Zastava milled receivers, Zastava stamped receivers, and Bulgarian milled receivers. NOTE! The GS-0015-A will not work on a Russian Type 3 since the pistol grip screw enters at a different angle. This part is manufactured from AISI 1018 cold-drawn steel that is not heat-treated. It holds all three (03) rivets securely in order to form the heads on the inside of the receiver. It is supplied with a diameter M6 x 0,8 x 30,0mm socket-head cap screw to hold the assembly securely as the rivets are headed. Note – it can also be used to hold a receiver section from drilling the heads from old rivets.